When I was about 7 (I’m 80 now), I already knew I loved to run. I raced my mom from the hen house to the windmill. She won without breaking a single egg in the half-filled bucket she carried. Three or four years later, I raced on a track in Nemaha County, Kansas. I was smart enough to know I better not wear my Sunday or school shoes, so I ran barefoot. My long-legged friend beat me that day. For every runner, the sport has personal meaning. For me, it is nature and friends. The low growl of the snow-covered earth under my feet at the end of February. The Mountain Goat run, when there were five peaks. A 50-miler and feeling the wind from the banks of Lake Erie. But more so, friends. Running friends have a particular bond, even if they were strangers moments before. How does one talk about the impact of running? You don’t have to be fast or athletic. You don’t have to have expensive equipment. You don’t even need youth. You just have to start. That is why I want to bring the Madison Square Garden track to Syracuse in time for the 2019-2020 indoor track season. 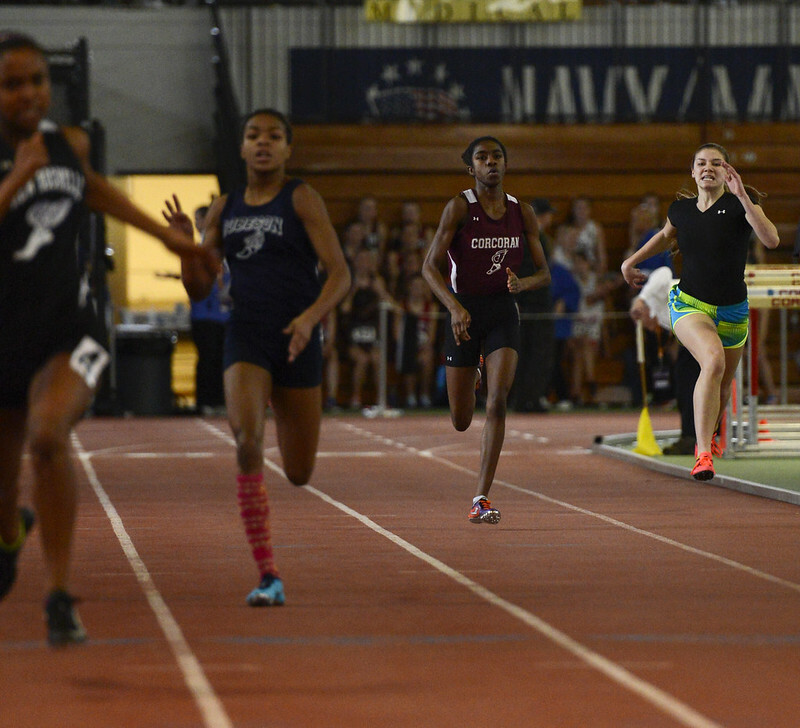 The banked board, portable track has a storied history in the Millrose Games. In 2005, Bernard Lagat set a track record for the famous Wanamaker Mile (3:52.87), running in the footsteps of greats like “Chairman of the Boards” Eamonn Coghlan and Olympians Jackie Joyner-Kersee and Mary Decker Slaney. When the games were moved a few years ago, the track was put in storage. It recently became available. I want more of our young people to discover how far running can take them — young people like a student at one of Syracuse’s poorest schools. After the first round of the District Qualifying Youth Track Meet in 2017, this boy carrying his gold medals found me on the infield wondering who to give them back to saying, “I can’t go to the next round.” We made sure he kept them. In 2018, his two fast feet carried him successfully through the qualifiers at Nottingham High School, the regionals in Ohio, a side trip to the Liberty Games in Schenectady and then to the Drake University campus in Des Moines, Iowa, for the finals of the AAU National Junior Olympics. This boy runs a fine 400-meter race faster than any but the very fastest. He did it by himself. That’s the magic of running. I watched his race, full of pride. Five colleges would be in touch soon, as well as two individuals who were ready to pay for his college tuition. I was a teacher in Syracuse where children, my students, were forced to grow up too soon. Their reality, as I have had to say far too often is, “shoot or be shot.” These kids were like my own. I studied them, cared for them and hoped to inspire and save them. Like Jamar. He was a tall 5-year-old who galloped everywhere. He died at age 22, shot in the belly. There is “M,” who left school at age 16 and within the week killed a man in front of a bar for the $5 the man had in his pocket. That sweet-faced, dimpled child is in state prison for life. The fates of Jamar and M did not have to be any more than it should be for any of our city kids. So what is my plan? I wish to bring together my love for running, children and the promise they have to change lives. I wish to bring the Madison Square Garden track to Syracuse as a gift for these children, our children and their families. Surely, the Madison Square Garden track is not a guarantee of a better life. But it is an opportunity for them to have something that is for them. It is portable and purchased. If returned to international specs as it once was in the Garden, not only can it serve our families but it can return revenue as well. A community track could surround the Garden track. Grandpas pushing strollers around the community loop, moms and dads getting some exercise in a place they can walk to from their homes. A safe place, no matter the weather or the world outside. There are many hurdles: finding a building large enough to put the track inside; dozens of people to set it up and take it down; volunteers for track events, and evangelists to spread the word.